No Mercy is a collection of horror poetry from Alessandro Manzetti. No Mercy is dedicated to the late, great Janis Joplin. Some of these poems placed me right into Port Arthur, Texas and "the smell of river and summer". I had to look up where Alessandro Manzetti is from to find out if he is simply that big of a Janis Joplin fan or if he is actually from my part of the world. It turns out he lives in Italy. I cannot claim to be an authority on poetry. I love reading it when I come across it, but I've never really made an effort to seek out modern poetry. I used to subscribe to a lot of fiction magazines (mostly horror) and that's where I've been exposed to most of the modern poetry that I have read save for a few anthologies that have included them. My personal feeling toward poetry is that it should evoke some sort of emotion from the reader. Perhaps I only feel that way because all of my favorite poems have done that, and as I stated, I'm not any kind of an authority on what poetry should or should not do. For me, No Mercy was very successful in evoking emotion. For that, I think it is a wonderful collection. Unfortunately, the emotions it evoked for me were not pleasant. I feel like No Mercy did it's job, but I wasn't the perfect audience. 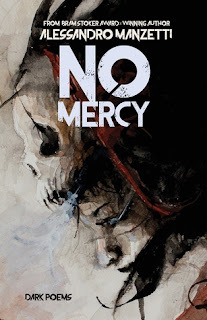 No Mercy is a perfect title, I suppose; it's a very bleak collection. I have no doubt there is an audience that will connect with all of the poems in No Mercy, and it will be a solid collection for those readers. If you look at the ugliness of horror and see beauty, you might be the right fit. I look at horror as something to overcome. I see horror as a balance to the light. It's more of a source of entertainment for me than something I try to internalize. I don't want to dissuade anyone from reading this collection, though, because your mileage certainly could vary. I don't read a lot of poetry but I can definitely see the appeal of it with a horror-related theme. Also, that cover is AWESOME! I'm glad you liked this one and it's cool when you can find some connection with the author. Yep, yep, it's hard to resist that cover and the genre. Me and poetry don't get along but horror poetry??? That could be interesting. I know. I'm wanting to see what other collections of horror poems I can find. I love that cover. Probably not for me but it sounds interesting. Love that blurb- Janis Joplin and Southern Comfort lol. That cover really is pretty sweet.